IN the mag, we’ll run a series of trail guides that will take you to an endless number of sensational singletrack (okay, sometimes doubletrack) trail runs of between 5km and 30km, all located within an hour’s drive of cities and major towns in Australia and New Zealand. In the magazine they look all pretty with inspirational images. In the long run (pun intended) we’ll get a raft of them up here for download. But in the meantime we’ll list a few as tasters, below, in simplified form or check out the mag where there’s three more (NZ & AU). DEFINING CHARACTERISTICS: more singletrack than you’d think, a smattering of technical, and fire roads through an array of forests. Undulating terrain around a 1000m peak with two sharp downhills, a slow climb and a just-before-finish sharp incline. Trails Plus also runs a great event here, the Mt Macedon 50/30 trail races www.trailsplus.org. 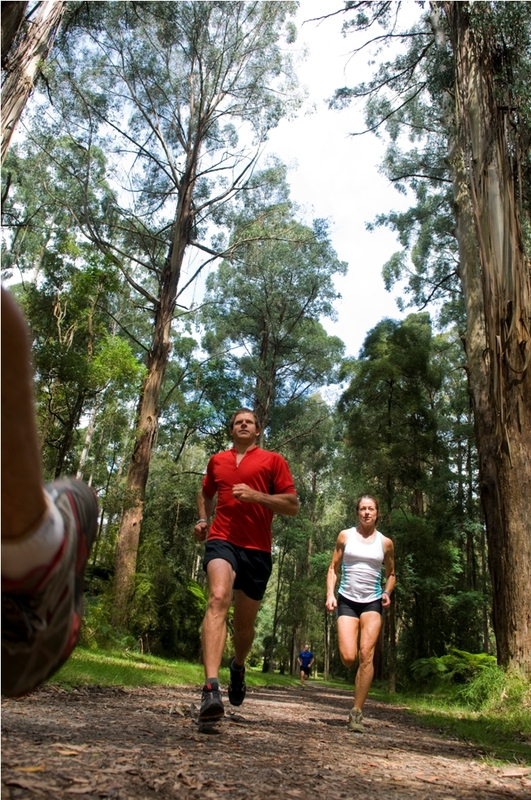 Roughly running along the Race 2 route of the Salomon Trail Run Series to be held on 31 July, this course takes in the sub alpine environment and lofty views from spectacular Mount Macedon at the southern end of Victoria’s Great Dividing Range. Providing plenty of ‘wow’ factor the 12.5km route makes for magnificent trail running as you complete a circumnavigation of this iconic peak on a flowing mix of 4WD tracks and undulating single track through the forest. The start / finish area is located at the Mount Macedon Tea Rooms just a short walk from the towering Memorial Cross with its imposing position and lookout over Melbourne, Port Phillip Bay, the You Yangs and surrounding farmland. Head off north along Cameron’s drive until you see Francis Road turnoff. Drop down to your right here, descending roughly 100m. At the end of Francis Road, turn left onto Clyde Track, ascending on a track through the remnant stand of wet Messmate/gum forest and skirting McDonald Reservoir to your right. Heading north along Clyde Track you’ll come to a walking trail alongside Cameron Drive, turn right and run along until you get to McDonald Reservoir/Camels Hump car park. Cross over Cameron Drive and take a small detour up Camel’s Hump. Returning down Camel’s, hook to your right and head west on the trail towards McGregor’s Picnic Ground. This undulating track goes into single trail and crosses several management access roads before curling to the south along the western slopes of the range. Sensational views on a clear day. The trail has led you back to the summit and the iconic Memorial Cross. From here you drop sharply down. After about a 150-200 metre drop, sing left onto Hoods Track. It will shoot you back northm setting you up for a final climb back to the Summit. You’ll hit Alton Road briefly before hooking left up Francis Road (the same trail you started down at the beginning), and back to the Tea Rooms finish at the car park. POST RUN GOODNESS: You only get to visit the Mount Macedon Spa (www.macedonspa.com.au) if you do the loop, say, three times. It’s that good you have to earn it: the centre combines the Macedon Spa Motel, Macedon Views Restaurant and Macedon Day Spa, with a mouth-watering meals, massages and stunning views. You can even stay overnight for pure indulgence with spa-equipped rooms. Fancy a chocolate truffle body wrap? Macedon Views Restaurant has established itself as the area’s favourite restaurant. If you’re just after a post run coffee and snack, try Mt Macedon Trading Post with the cosy warmth of the fire in winter. Sitka also has a seasnonal menu with fine foods on offer including their famous chocolate brownie and Lindt hot chocolates. And if you like your boutique Pinots, head to Chanters Ridge (www.chantersridge.com.au) in nearby Woodend (which also has plenty of great foodie options).